Carroll Cave Conservancy | Dedicated to the study, conservation and preservation of the Carroll Cave watershed. The attached document is an outline of the topics covered during trip leader training. Although it is mainly intended for those who are leading trips in Carroll Cave, the information is useful to anyone who participates on a trip. This outline was created some years ago. It is still relevant, though a few items are dated. Editor’s note – This trip report was written by Hou Zhong. The links below go to two press releases. 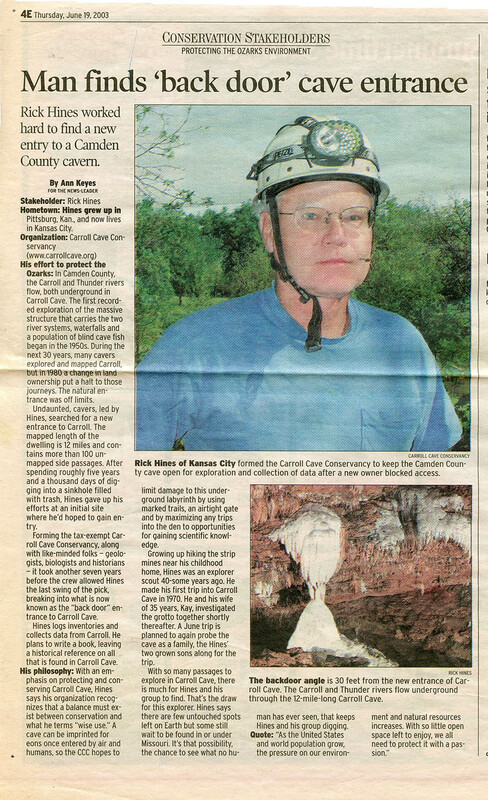 The older article ran in the Ozarks news-Leader newspaper on 19 June 2003. The newer article was issued in February 2019 and describes the recent acquisition of land around the silo entance.